This is the Wave City coffee table by designer Stelios Mousarris. 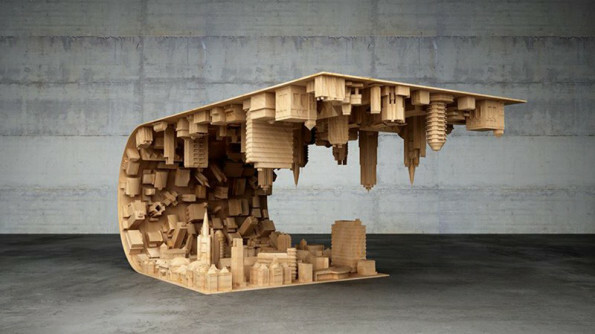 He was inspired by the movie Inception so he made a coffee table showing the city of Los Angeles folding over itself just like the movie. Alternatively he could have just built a coffee table within a coffee table and called it day. But he’s the artist here! I’m just a lowly blogger, typing with Cheeto dust-crusted fingers from a Ninja Turtle sleeping bag on the floor. I don’t even have a coffee table! What the hell do I know? I haven’t even seen Inception. I’m the least qualified person to talk about any of this!